This also makes a brief appearance in the same novel, and one of the leading characters in the forthcoming Classic in the Clouds is a Bentley enthusiast, being devoted to racing model Bentleys round a Brooklands race track laid down in his garden. A new level of achievement was represented by the Bentley Mulsanne Turbo. It offered really crisp acceleration. 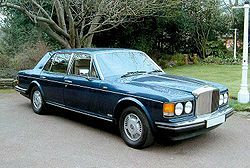 Driver and passengers were catered for in a unique environment dominated by a highly polished walnut veneered fascia, blemish-free leather and carpets and headlining of pure wool. A radiator shell painted in the car’s colour, light alloy wheels and ‘Turbo’ labels attached to boot and front wing flanks distinguished the Bentley Mulsanne Turbo from the Bentley Mulsanne. This entry was posted in The Colby Cars and tagged Classic in the Barn, Classic in the Clouds. Bookmark the permalink.